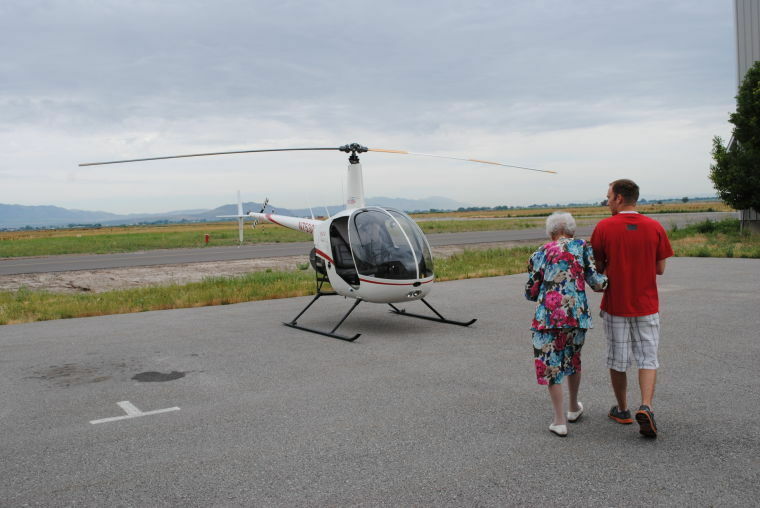 LOGAN – Brock Boulter decided to take his 95-year-old grandma Frances Stewart on a helicopter ride after it was decided she couldn’t accomplish her dream of skydiving. “I used to want to be . . . years ago, of course . . . a famous skydiver. I found out that was no longer possible and I was telling Brock about it,” explained Stewart. 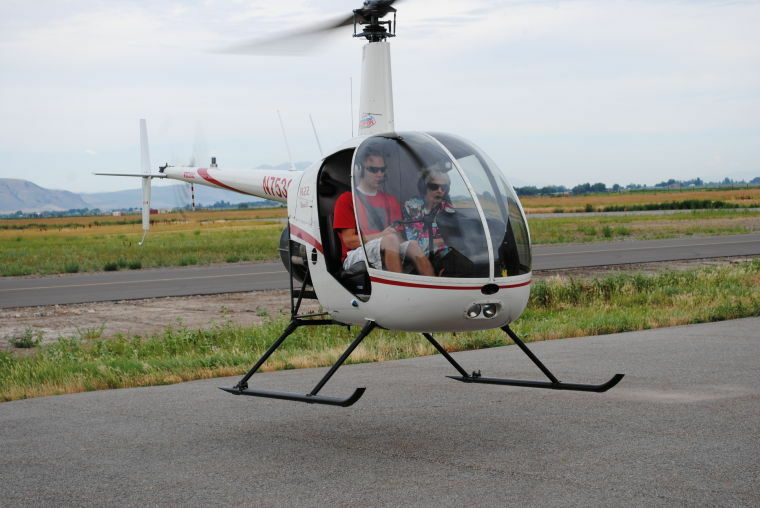 Boulter, who almost has enough hours of flight time at Mountain Ridge Helicopters to become an instructor, decided taking his grandma on a helicopter ride could be an exciting alternative to her skydiving dream. On Friday morning, the ride over Cache Valley occurred and several family members were in attendance to support Stewart. Stewart, who has seven children, 17 grandchildren and 21 (nearly 22) great-grandchildren, climbed in the helicopter with Boulter’s assistance and didn’t appear to be nervous at all. 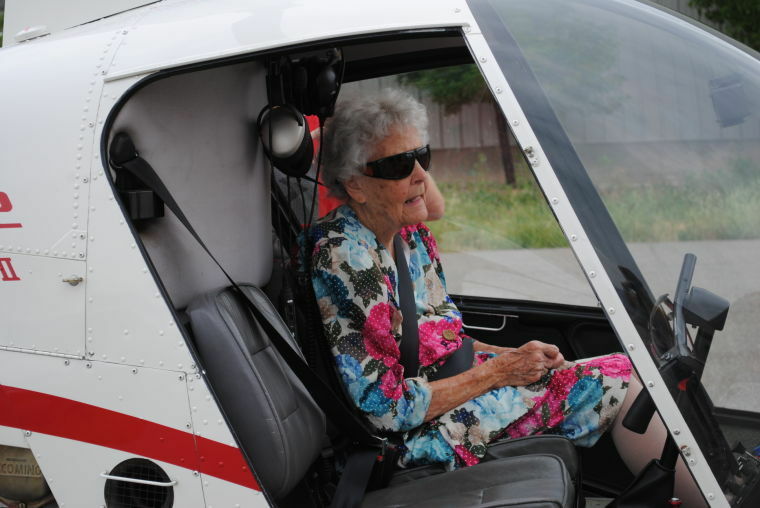 Wearing a colorful floral dress and with hankie in hand, the Kaysville resident looked like a natural as she took off through the air with her grandson. Stewart grew up in Whitney, Idaho. She said as a young girl, she dreamed of being beautiful, famous and rich. While she claimed she may have not accomplished all of those things, she did say she is happy. She said she gets her happiness from her family. “I used to jump out of bed at 3 o’clock in the morning to feed my babies. That’s about the only jumping I did,” said Stewart of not getting to jump out of a plane. Stewart has macular degeneration, which causes vision loss. However, her daughter said she still has some peripheral vision left, making it possible for her to enjoy the view from the helicopter.